Injuries to the flexor tendons of the hand are common. Each specific movement of the hand relies on the finely tuned biomechanical interplay of intrinsic and extrinsic musculotendinous forces. Considering the hand's role in labor, entertainment, art, literature, and passion, hand surgeons should fully define the normal and pathologic boundaries in each patient examined. With injuries that involve flexor tendons, fully defining the pathology is especially important. For patient education resources, see Hand Injuries and Finger Injuries. Flexor tendons of the forearm originate from the muscles based on the medial epicondyle and on the proximal radius and ulna. Flexor tendon muscle bellies have three layers: superficial, intermediate, and deep. The superficial layer consists of the pronator teres (PT), which is the most radial of the superficial muscles. The flexor carpi radialis (FCR), palmaris longus (PL), and flexor carpi ulnaris (FCU) proceed in a radial-to-ulnar direction, in that order. The flexor digitorum superficialis (FDS) is the only muscle of the intermediate layer. This muscle has two separate heads of origin: the radial head of the medial epicondyle and the ulnar head of the ulna and radial head from the brief muscular line of the radius. The two muscles of the deep layer are the flexor digitorum profundus (FDS) and the flexor pollicis longus (FPL). The FDP originates from the proximal two thirds of the ulna and from the interosseous membrane, and some element of the muscle may originate from the proximal radius. The FPL originates from the middle third of the radius and from the interosseous membrane. 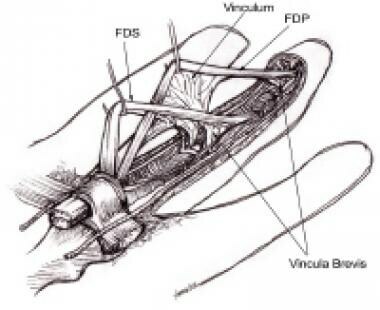 The FDS and FDP tendons travel through the carpal tunnel to insert in the fingers. The FPL is the most radial structure of the radial tunnel; it extends on the volar aspect of the first ray. The FDP tendon inserts into the base of the distal phalanx, whereas the FDS tendon inserts into the base of the proximal phalanx. At the level of the A1 pulley, the FDS tendon decussates to form the Camper chiasma. The FDP tendon extends through the chiasma from below the FDS tendon to become the more superficial tendon. The FDP tendon flexes the distal phalanx and secondarily flexes the proximal interphalangeal (PIP) joint and the metacarpophalangeal (MCP) joint; the FDS tendon flexes the PIP joint and secondarily flexes the MCP joint (see the image below). The ulnar nerve supplies the FCU, the ulnar two FDP tendons (to the little and ring fingers), and the intrinsic muscles of the hand (except for the radial two lumbrical muscles, the opponens pollicis, and the abductor pollicis brevis). The median nerve supplies the remaining extrinsic flexors in the forearm, the radial two lumbrical muscles, and the thenar muscles (except for the deep head of the flexor pollicis brevis [FPB], which is innervated by the ulnar nerve). The fibro-osseous canal is the tunnel in the digits where the flexor tendons are located. The metacarpals form the dorsal wall, and the annular pulley system and flexor sheath provide radial, ulnar, and volar coverage. The flexor synovial sheath of the fingers is present from the midpalm up to the level of the FDP insertion. The sheath for the thumb and index finger often proceeds down through the carpal tunnel and can join up in the distal forearm in a horseshoe bursa configuration. The annular and cruciform pulleys form an intricate constraining sheath to keep the tendons close to the bone, preventing bowstringing during their excursion to flex the MCP, PIP, and distal interphalangeal (DIP) joints. Three cruciform pulleys (C1-C3) and five annular pulleys (A1-A5) exist (see the image below). From a biomechanical vantage point, the A2 and A4 pulleys are considered the most important to the prevention of bowstringing. Retinacular portion of flexor tendon sheath. The internal vascularity of the tendon is primarily positioned in the septa of the endotendon separating the tendon fascicles. It should be noted that the vascular supply is mainly on the dorsal side of the tendons. The tendon in the area of the proximal phalanx also has a relatively poor blood supply. Extrinsic nutrition is provided by synovial fluid diffusion that occurs as synovial fluid is pumped into the tendon fibers during flexion and extension of the fingers. The functional biomechanics of the flexor tendons depend on a number of factors, including an intact pulley system, synovial fluid, supple joints, and tendon excursion. The synovial fluid not only provides nutrients to the tendons but also is a constant source of lubrication, permitting frictionless gliding between the tendons. Adhesions between the tendons and other tissues restrict excursion. Stiff joints limit motion and function despite a normal tendon system. The loss of the pulley system no longer prevents the tendons from gliding juxtaposed to the phalanges. The tendons bowstring away from the skeleton as the finger is flexed. This bowstringing increases the moment arm (a line drawn from the midaxis of the joint to the flexor tendon) of the tendon at that point. Greater excursion of the tendon and a greater amplitude of muscle contraction are required to obtain the same amount of finger flexion. The clinical ramifications of tendon bowstringing are a weakened grip, incomplete flexion, and an ensuing stiffness of the joints. During normal tendon excursion, passive MCP joint movement produces no relative motion of the flexor tendons. DIP joint motion is 1-2 mm of FDP tendon excursion per 10º of joint flexion. 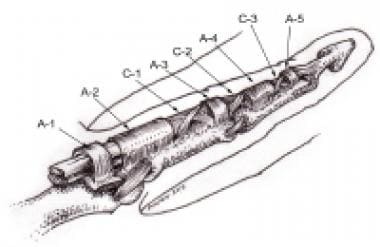 PIP joint motion is 1-2 mm of FDP tendon and FDS tendon excursion per 10º of joint flexion. Differential excursion is increased with a palmar bar or synergistic splints (wrist extension). The overall excursion of the FDS and FDP tendons is approximately 88 mm and 86 mm, respectively, to obtain total digit and composite flexion. Excursion of 2.5 cm is required for complete flexion of the fingers. Hemostasis is characterized by vasoconstriction, platelet deposition, and fibrin clot. The amount of clot may affect the ultimate repair by increasing the number of adhesions. Inflammation involves diapedesis of proinflammatory cells. Neutrophils and macrophages pass from the intravascular space to the extravascular space, proinflammatory cytokines are released, and fibronectin is used as scaffolding for collagen deposition and vascular ingrowth. This phase lasts approximately 0-7 days. Proliferation is characterized by a marked rise in fibroblast proliferation occurring within 1 cm of the repair site. This phase lasts 2-28 days. The epitenon cells proliferate and migrate into the zone of injury. These cells are analogous to the epithelium of the skin, as they quickly cover the surface of the repair site in an attempt to restore a gliding surface. Collagen deposition rises markedly and rapidly as the fibroblasts proliferate. The vascular ingrowth can then migrate in via the collagen-fibronectin scaffolding. Remodeling is marked by the growing strength of the repair. Collagen fibers are increasingly reoriented to become parallel with the noninjured tendon fibers, and collagen synthesis slows. The clinical importance of this phase, which starts at about week 6, is that during this interval, active and passive range of motion (ROM) is mandated to promote tendon excursion and diminish local adhesions. The ROM of all digits is increased, external scar control and blocking exercises are initiated, and resting exercises and strengthening procedures can be started. Flexor tendons can become disrupted from either open or closed injuries. Minor puncture wounds or lacerations over the flexor tendon can result in partial or complete transection. Open injuries are often associated with other neurovascular deficits. Closed injuries are frequently related to forced extension during active flexion of the finger. This type of avulsion injury, in which the FDP tendon ruptures at its insertion to the distal phalanx, is called Jersey finger. Flexor tendon rupture from chronic attrition may occur in rheumatoid diseases, Kienböck disease, scaphoid nonunion, a hamate fracture, or a Colles fracture. So et al conducted a prospective study to compare five different evaluation systems for flexor tendon repair. They reported significant discrepancies among the evaluation methods. Currently, no universally accepted evaluation method exists for flexor tendon repair. Brockardt et al compared the flexor tendon repair strengths of one throw of looped suture across a repair site versus two separate throws of suture to determine whether one throw is equivalent to two separate throws and whether fewer passes with Fiberwire is equivalent to more passes with Supramid. They determined that one looped suture does not substitute for two separate passes of suture and found that two-stranded Kessler repair with Fiberwire was equal to four-stranded cruciate repair with Supramid. Adham et al described four cases of ruptured flexor tendons following volar plate fixation for distal radius fractures. According to the authors, either poor bone stock or multiple bone fragments caused the plate or nonlocking screws to loosen, irritating the flexor tendons and leading to rupture. The flexor tendons involved included the FCR, FPL, FDS, and FDP to the index and long fingers. Lalonde DH. An evidence-based approach to flexor tendon laceration repair. Plast Reconstr Surg. 2011 Feb. 127(2):885-90. [Medline]. Khor WS, Langer MF, Wong R, Zhou R, Peck F, Wong JK. Improving Outcomes in Tendon Repair: A Critical Look at the Evidence for Flexor Tendon Repair and Rehabilitation. Plast Reconstr Surg. 2016 Dec. 138 (6):1045e-1058e. [Medline]. So YC, Chow SP, Pun WK, et al. Evaluation of results in flexor tendon repair: a critical analysis of five methods in ninety-five digits. J Hand Surg [Am]. 1990 Mar. 15(2):258-64. [Medline]. Brockardt CJ, Sullivan LG, Watkins BE, Wongworawat MD. Evaluation of simple and looped suture and new material for flexor tendon repair. J Hand Surg Eur Vol. 2009 Jun. 34(3):329-32. [Medline]. Adham MN, Porembski M, Adham C. Flexor tendon problems after volar plate fixation of distal radius fractures. Hand (N Y). 2009 Dec. 4(4):406-9. [Medline]. [Full Text]. Gulihar A, Hajipour L, Dias JJ. Comparison of three different peripheral suturing techniques for partial flexor tendon lacerations: a controlled in-vitro biomechanical study. Hand Surg. 2012. 17(2):155-60. [Medline]. Nassab R, Kok K, Constantinides J, Rajaratnam V. The diagnostic accuracy of clinical examination in hand lacerations. Int J Surg. 2007 Apr. 5(2):105-8. [Medline]. Noaman HH. Management and functional outcomes of combined injuries of flexor tendons, nerves, and vessels at the wrist. Microsurgery. 2007. 27(6):536-43. [Medline]. Bodner G, Rudisch A, Gabl M, et al. Diagnosis of digital flexor tendon annular pulley disruption: comparison of high frequency ultrasound and MRI. Ultraschall Med. 1999 Aug. 20(4):131-6. [Medline]. Tang JB, Chang J, Elliot D, Lalonde DH, Sandow M, Vögelin E. IFSSH Flexor Tendon Committee report 2014: from the IFSSH Flexor Tendon Committee (Chairman: Jin Bo Tang). J Hand Surg Eur Vol. 2014 Jan. 39(1):107-15. [Medline]. Strickland JW. Opinions and preferences in flexor tendon surgery. Hand Clin. 1985 Feb. 1(1):187-91. [Medline]. Strickland JW. Results of flexor tendon surgery in zone II. Hand Clin. 1985 Feb. 1(1):167-79. [Medline]. Strickland JW. Flexor tendon surgery. Part 1: Primary flexor tendon repair. J Hand Surg [Br]. 1989 Aug. 14(3):261-72. [Medline]. Osada D, Fujita S, Tamai K, Yamaguchi T, Iwamoto A, Saotome K. Flexor tendon repair in zone II with 6-strand techniques and early active mobilization. J Hand Surg Am. 2006 Jul-Aug. 31(6):987-92. [Medline]. Taras JS, Gray RM, Culp RW. Complications of flexor tendon injuries. Hand Clin. 1994 Feb. 10(1):93-109. [Medline]. Watanabe K, Ota H, Sasaki H. Eight-strand Cross-locked Cruciate Flexor Tendon Repair Using Double-stranded Suture: A Description of the Surgical Technique. Plast Reconstr Surg Glob Open. 2016 Nov 7. 4 (11):e1048. [Medline]. [Full Text]. Akbari H, Rahimi AA, Ghavami Y, Mousavi SJ, Fatemi MJ. Effect of Heparin on Post-Operative Adhesion in Flexor Tendon Surgery of the Hand. J Hand Microsurg. 2015 Dec. 7 (2):244-9. [Medline]. [Full Text].